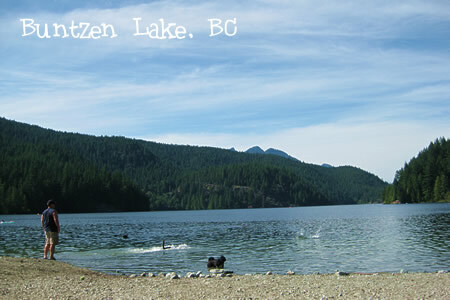 One of my favorite things that happened this summer was discovering Buntzen Lake, about 30 minutes outside Vancouver. It’s a beautiful lake surrounded by mountains, but is (surprisingly) not that cold. Definitely a lot warmer than the ocean & much warmer than a lot of the Alberta lakes I attempted to not only swim but wakeboard in. And the best part? There’s a dedicated leash-free section just for dogs! She was less than impressed with me, but I won her back by taking her out on the little blow up boat. She snuggled in my lap, dry as a bone, soaking up the summer sun. OK, she still doesn’t look very impressed in this photo, but who can blame her? 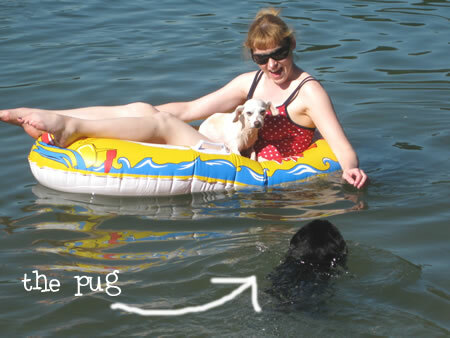 Nobody likes having their picture taken in their swim suit.